Rahm Emanuel, who in October resigned from his post as White House Chief of Staff to run for Mayor of Chicago, currently leads in that contest by more than 30 points, according to a new automated poll conducted by Illinois-based polling company We Ask America for the Chicago Retail Merchants Association. 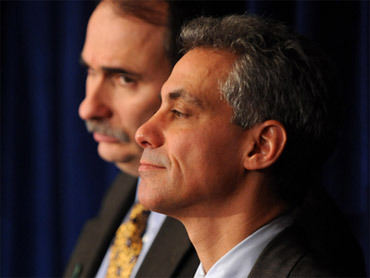 The poll shows Emanuel leading every demographic, with 43.83 percent support overall. Gery Chico comes in a distant second with 11 percent support, and Carol Moseley Braun follows with 7.78 percent. About sixteen percent of voters said they were still undecided. The survey suggests that Emanuel, who represented Illinois' Fifth District for six years before leaving Congress for the White House in 2009, has widened his lead by about five points since November. Despite what appears to be a comfortable lead in the race, however, Emanuel's eligibility to run remains up in the air amid a number of challenges to the legitimacy of his Chicago residency. During a recent hearing before the Chicago Board of Elections, Emanuel, who rented out his Chicago home while working in Washington, fielded questions related to his claim that he qualifies under the law as a Chicago resident. (He was also pressed on some unrelated topics). He argues that he and his family perceived the move as a temporary relocation in order to serve the president. Burt Odelson, the leading attorney challenging Emanuel's residency, argues that local case law set a precedent requiring that a candidate maintain a "physical presence" in Chicago for a full year prior to an election. The Board of Election Commissioners said last night that Joseph Morris, the hearings officer who presided over the case, is likely to release his written recommendation (which is not binding on the board) by midday today. Regardless of the outcome, however, many believe that the question of Emanuel's residency will end up in the Illinois Supreme Court.